Yes, the method could be used “anywhere,” but there are also good reasons not to. First, straw bale culture is not really organic. With this method, plants are fed mostly by soluble fertilizers sprinkled on the bales. 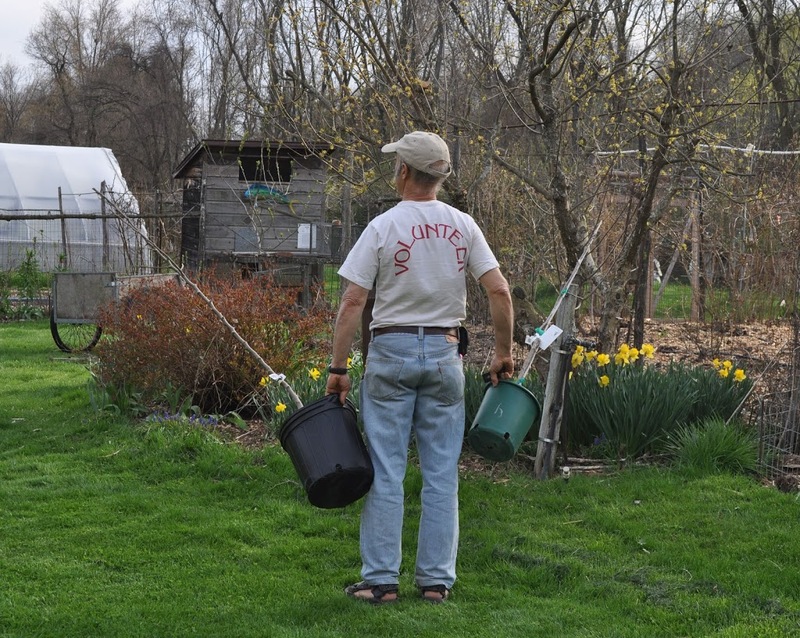 The essence of organic gardening is to feed the soil which, in turn, feeds the plants. Plant foods are released from the soil matrix through microbial action. Microbes respond, as do plants, to warmth and moisture, so nutrients become available to plants in synch with plant needs. In straw bale culture, roots are bathed in readily available nutrients whether they want them or not. Barring diseased soil or trying to garden on a rock ledge, why use straw bale culture in the first place? What’s wrong with dropping a seed in waiting furrow in the ground? Not that I’m that rational a gardener, especially this time of year. opposed to wandering into a garden center this time of year, when such places are awash with all sorts of desirable plants, picking out a plant you like, and then running around the yard with it trying to decide where to plant. The plant is readily available in Britain, but not here. All of which made it all the more desirable. Did I really need a Concorde pear tree? Aren’t the more than 20 varieties I now have sufficient? Evidently not. As luck would have it, a nursery an hour away had Concorde. The nursery, of course, had many other desirables also. So I also bought Black Gem, a named variety of black walnut. Not that there aren’t plenty of wild black walnuts around here, but this was a named variety. So today I will run around the yard with these two plants trying to decide where to plant them. and nut trees, grafting. McIntosh is a named variety of apple. Seedling apple trees that pop up randomly along roadsides are not. All plants of the same variety name are genetically identical. Named varieties are not available for every plant and, for some, pretty much all seedlings are quite good. The hedge of Nanking cherries along my driveway — and now in bloom! — are merely seedlings, but all the plants are beautiful and yield, in a couple of months, great quantities of tasty cherries with virtually no effort on my part. No varieties are available. Black Gem, according to the tag, yields “huge crops of light-colored, high-quality, delicious nuts that crack in large segments and offer a superior nutmeat-to-shell ratio. Thin husks slip off easily.” How could I resist? This entry was posted in Uncategorized and tagged Black Gem, black walnut, Concorde pear, Nanking cherry, New York Times, straw bale culture, Weedless Gardening. Bookmark the permalink. Trackbacks are closed, but you can post a comment. We found some Concorde pears at a local Whole Foods and were amazed by the Vanilla taste. We have been trying to find one ever since, along with a spot to plant it. I’m glad to hear the endorsement. I never did figure out where to plant the tree I bought. It’s still in a pot and will remain so until next year. Then I might just cut off a stem and graft it onto one of my many other pear trees. The Concorde pears are back in our local (Memphis, TN) Whole Foods store. They may now be in your area if you want a taste. Thank for the information. I was in Ithaca, NY to give a lecture at Cornell and stopped into the orchard store there. They had Concorde; they tasted very good. Concorde is still in a pot but I will definitely be planting it in spring. Honestly, you have the most timely posts! I was tempted into trying the straw bale gardening (in two places that will someday have a raised bed, but I’m too busy to build them this year.) We will see how it goes, I’m growing Amish Paste tomatoes next to each other, one in a bale, and one in a raised bed. A friend at church said she tried it last year, and it was a big disappointment, because they dried out so fast with our drought. 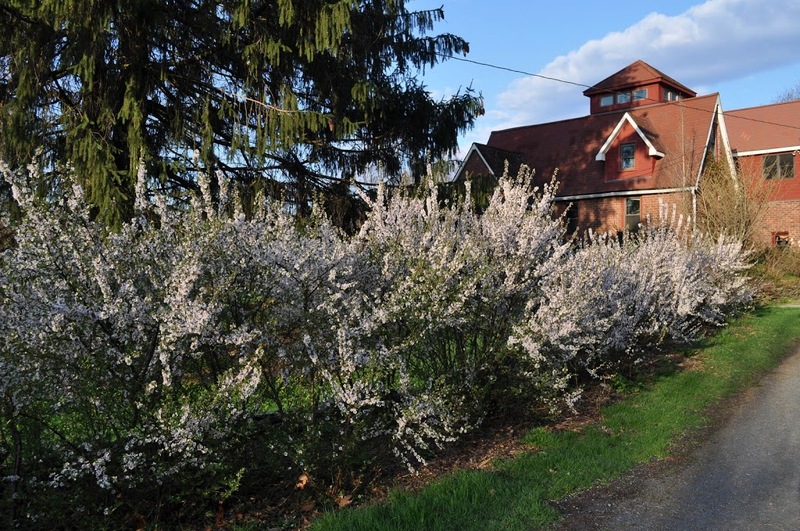 The Nanking cherries are blooming at the Madison Arboretum, too. Lovely! I can’t wait for mine to fill out. When I was in grad school in Madison, I lived across the river on Troy Drive. On my bike ride to campus, I would go by a golf course along which was a hedged wall of Nanking cherries. That wall became a fruiting wall in June. I love your book, Landscaping with Fruit, and am building a landscape plan for our new home centered on beautiful edibles. I am surprised that I am having such a difficult time finding many of the varieties you describe. I’m starting with Nanking Cherries. Do you know where I can find them online? Or do they have another name that may be more common? The appendix of the book has a list of nurseries that I recommend; a few of them offer Nanking cherries. Raintree Nursery, for example. If you google “prunus tomentosa” you should get a lot of other mail order nursery sources also.